Chicken and beer is popular in South Korea because it’s awesome and Koreans aren’t dumby-dumbs. KFC in Korea stands for Korean Fried Chicken, and let me tell you something. It’s better than the chicken that old crusty colonel is serving up. When ordering, you have to keep in mind that you’ll be getting a whole chicken chopped-up into standard drums, thighs, breast, even the head. When you take this into consideration, it’s not really that expensive of a meal. Well, that depends on how many beers you need to wash it all down. 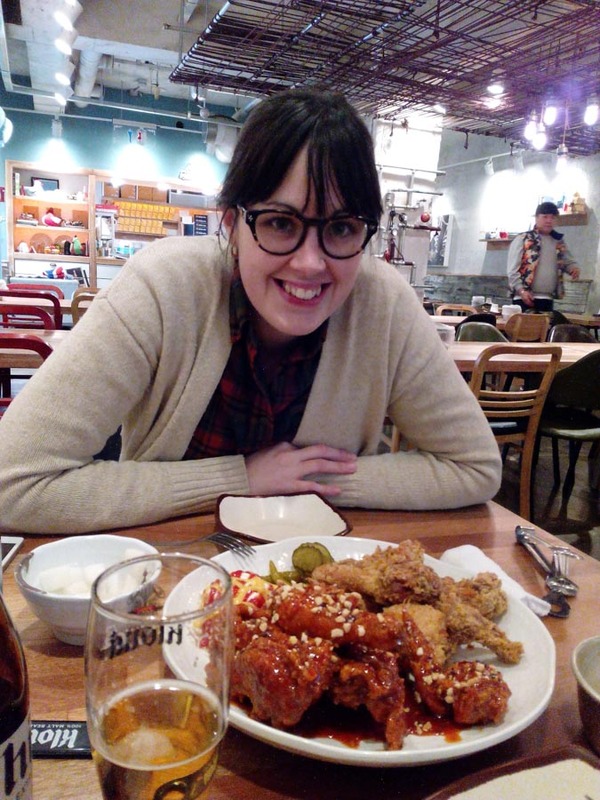 Our first meal in Korea had to be fried chicken and beer – not because it’s what we wanted most, but because it would always be in the back of our minds when deciding what to have for dinner. We needed to get it out of our system. Korean fried chicken is usually double-fried so it’s incredibly crispy. You can get it with a sweet and spicy sauce on it, or plain. Better yet, make like me and order the banban (반반) – half sauced, half not. Sinpo International Market has a lot of amazing food. Unfortunately, their must-try snack is Dakgangjeong (닭강정) – boneless chicken pieces fried and covered in a sweet spicy sauce. It’s popular all over Korea, but Sinpo is known for it. We shouldn’t have blew our chicken wad the night before, cause this chicken looked amazing. One of the first of many bindaetteoks that we would take down on this trip. This one was unfortunately served to us cold, so it wasn’t great. More on bindaetteok below. Kind of like a corn dog but it’s wrapped in a sort of fish cake. We tried the hotdog version but they also had crab, cheese, and lots more. Who would have thought that South Korea would have a strong doughnut game? We had a fresh hot Korean twisted doughnut. It was honestly one of the best doughnuts I ever had. That night we went out for Korea’s most popular alcoholic drink, soju (소주). While I’m sure many of you are aware of soju, I’m not sure you know how deadly this stuff is. The name translates to burned alcoholic drink. While the first one might burn, it eventually starts going down pretty smooth. A typical bottle sits at about 20% alcohol and costs a couple bucks. We watched a neighboring table take down 3 bottles a person. We stopped at 2 each plus a couple beers (not that we were counting), drinking it down with a very tasty Korean pancake. This kim chi pancake is the perfect companion while drinking. It’s shallow-fried in oil making it crispy on the outside and soft on the inside. There’s a very slight spiciness to it. The next day we were absolutely devastated due to hungover. There was a lot of vomiting. A lot of headaching. A lot of wanting to die. To make matters worse, we had to checkout of our hotel and head to Seoul that day. Thankfully, the checkout time was 1PM, so we stayed in bed until 12:55 and then slowly made our way to the subway. We got about 10 steps before I puked in front of a street market. We had to stop at a cafe where there was more vomiting and a lot of sleeping like hobos. When our appetites finally made a return, we happened to be in one of the best food cities in the world. Seoul’s food scene is off the fork (and into my mouth). You can find amazing food almost anywhere, but we were on a budget, and it was -1 degrees Celsius (or 30 degrees freezer-balls), so street food was limited. It takes a bit of research to find budget meals in Seoul, but that’s probably why you’re here, so I’ll get on with it. Personally, I don’t like the name mandu (I’m not sure why), but I love the food. They’re Korean dumplings. At first, I thought they’d be similar to jiaozi (Chinese dumplings), but I actually found that their thicker wrappings made them more similar to pierogies. The fillings vary from minced meat, kimchi, tofu, cabbage, and other vegetables. Cooking methods include: pan fried (gun-mandu – 군만두), boiled (mul-mandu – 물만두), and steamed (jjin-mandu – 찐만두). This place was amazing and it’s conveniently located off an alley in Insadong. We ended up spending about $7 for a filling platter of unforgettable food. While Seoul’s most famous shopping street is popular for its clothing and accessory shopping (pfft, you can’t eat those things), the street food is what will keep you coming back. What translates to Carassius (a type of fish) bread, Bungeo-ppang doesn’t contain any fish, but it’s normally filled with a sweetened bean paste. You wouldn’t like Sara when she has a dessert with beans in it. This one is filled with nutella – a much more sane choice. It’s been a while since I fell madly in love with something. I’m a huge egg fan – they’re like nature’s perfect food – so when I saw these buns, I had to eat one. More Gyeran-ppang, but this version has bacon and cheese on it. Jeeeeessssusss! These are freshly made little loaves of bread with an entire egg in them. The egg is kind of poached in the bread batter. As I said before, it was bloody cold while we were there, so we didn’t get to sample as much as we would have liked, but this girl does a great job documenting the amazing food available in Myeongdong. Most of the curry you will find in South Korea is similar to the Japanese style of curry. This small place located down a back alley, has tasty bowls of vegetarian curry – vegetables and potatoes with rice – for only 5000 KRW ($4.30). We stayed in the Myeongdong area because it was central to most things. In hindsight, I think one of the smaller, less touristy neighborhoods would have been better. A big part of this is the cost of food. Restaurants in the Myeongdong area mostly cater to tourists, and the prices are often higher than what you’d pay in a typical neighborhood. We found some cheaper restaurants, across from the pedestrian street, on this narrow street. When Sara ordered sausage soup, I had a feeling that she would regret it. Korea is known for its blood sausage (sundae). It’s made by stuffing pig’s blood, cellophane noodles, spices, and some organ meats into pig’s intestines. The broth of the soup is milky and peppery. There was more offal (liver, lungs, bits of cartilage) in the soup. Sara was not happy with her choice, so I traded her for my bulgogi. She got the better end of the deal, but the soup was still pretty tasty. One of Korea’s most famous dishes, this roasted beef dish is flavorful and addictive. Thin slices of beef are marinated then grilled. It’s served in a stone pot, sizzling in juices. In the heart of Namdaemun Market, the largest market in Korea, are two alleys that are devoted to cooking awesome fish. Hairtail is a type of cutlassfish. They’re long and ugly, which generally means they are delicious. The alley is lined with restaurants that offer fried, steamed, and braised fish. It was a memorable meal, not only because of the food, but also for the atmosphere. If we go back to Seoul, I think we would stay in the Hongdae area, where there are several universities and a young local crowd. It’s lively, authentic, and packed with restaurants and bars. The narrow winding streets offer a vibe that is more my style. We only spent one day in the area, which wasn’t nearly enough time to try all the amazing food, but we did have some incredible pork cutlets that were a steal. These fried pork cutlets are actually a Japanese dish (tonkatsu), but the Koreans (and we) love it because it’s cheap and delicious. Cochon Tonkatsu is hidden down an alley but is still always packed with savvy eaters. The meal in the photo was one of our cheapest in South Korea (3000KRW or $2.60) and it did not disappoint. After a few days in Seoul, we traveled to the hanok village of Jeonju. Jeonju is known for two things: the largest collection of traditional hanok houses, and food. The food is somewhat unique there, but they also do traditional Korean dishes better than anywhere in Korea (arguably). In fact, the very famous Korean dish bibimbap was invented there. The area is very fertile, so all the ingredients are very fresh and top-quality. The first night we arrived, we immediately headed to one of the most famous restaurants for bibimbap. It’s called Hankookjib, and they’ve been making bibimbap for over 65 years. Three generations have had a hand in crafting the dish. In 2011, Michelin named them the best bibimbap restaurant in the world. I tried the raw beef version, which had chunks of raw beef and a raw egg – similar to a steak tartar. It was the first time I had ever had raw beef and I loved it, but the real star of the show is the supporting cast. The fresh vegetables are top-notch, and both the red pepper paste and the soy sauce are made in-house. I’ll be honest, when the hot bowl arrived I quickly jumped in and started shoving food in my face. That’s right, I forgot to take a photo of the most famous Korean dish in the world. But I did manage to get a shot of all the amazing banchan that Hankookjib serves. If you’ve ever been to a Korean restaurant you’ve probably had banchan. It’s the small starter dishes that are served before the meal. They’re free and usually unlimited. A kind of kimchi is always present (I could write an entire article about the varieties of kimchi). Often a soup, or guk, is served. Out of all the banchan I had (pretty much every meal included some), Hankookjib’s was the best. From top-left to right: Deep-fried whole crabs covered in chili paste. The crunchy texture with a blast of crab juice made this one my favorite of the group; Kimchi made the traditional way – with napa cabbage; Geotjeori or Korean salad with a spicy and tangy dressing; Sigeumchi-namul – a blanched spinach with soy and sesame flavors; Kongjaban or Korean black beans are actually made from fermented soy beans (that’s right, that black bean sauce that you love is basically rotten soy beans) these are so tasty and addictive. Once you pop, ya can’t stop; Kongnamulmuchim are bean sprouts that have been blanched and lightly seasoned with salt, garlic, and sesame; On the very bottom left is kongnamul guk, or soybean sprout soup. The very light broth is made with anchovies; The red soup was a cold dish. I never came across this banchan anywhere else, but it was tangy and a bit sour; The bowls of brown liquid are actually makgeolli, a Korean alcoholic drink. Hankook jib makes their own makgeolli. This version tasted like an apple pie with cinnamon. The next day we went absolutely food-nuts. We spent an entire day walking around and sampling all the incredible dishes. Busan is on the southern coast of the country, so it’s great for seafood. In fact, the largest seafood market in South Korea is located in Busan. Of course, we had to pay it a visit, and when we got there we realized that we’d have to squeeze in an extra meal that day. Raw rock fish and a plate of vegetables on the main floor of the market. This was actually one of our most expensive meals in South Korea, but it was an unforgettable experience. Watch the video to see the amazing atmosphere, and click here for more information about visiting Jagalchi Fish Market. This is a cold noodle dish. We had it at a restaurant called 원산면옥. I wasn’t too sure about it at first – I’m not a huge fan of cold meals – but when everything was mixed up and I started delving into it, I really enjoyed it. The chewy buckwheat noodles present a different texture. The spiciness was perfect (you can get it less spicy if you want). It was extremely flavourful. The next day we took the Metro to the very end-of-the-line and started walking along the coast. The views were fantastic, but eventually we needed to warm up with a bowl of Busan specialty – a pork soup called duechi guksu (돼지국수). It’s eaten with rice and the milky broth turns pink after you stir the spicy paste through it. The slices of pork are tender, and it gave us a boost in much-needed energy. After that, we stopped at Haeundae Market to grab a ssiat hotteok (씨앗호떡). This is another specialty of Busan. Earlier you may have watched a video about a hotteok that is filled with brown sugar (see the Jeonju food day video) – this version of the stuffed pancake is filled with sesame seeds, sunflower seeds, pine nuts, and more. It was quite buttery, but pretty damn tasty. Watch the video to see both meals. The cuisines in China and South Korea are very different. When Chinese immigrants moved to Korea, they brought some of their dishes, but changed them slightly using Korean ingredients. I actually found that Korean-Chinese food is more similar to American-Chinese food than actual Chinese food. In fact, like in America, it’s a very popular take-out item in Korea. We tried a few dishes in one of the more popular junghwa yori restaurants in Busan. Probably the most popular Korean-Chinese food. I referred to this dish as ‘garbage food’. It’s wheat noodles in a black bean sauce with bits of pork. The Chinese equivalent would be Zhajiangmian (which of course is much better). The sauce was a bit bland, the noodles slighty overcooked, and it just felt like filler-food. The Korean version of sweet and sour pork. This was pretty good, but didn’t have the complexity that the Chinese version has. The sauce was tangy with a fruity pineapple-like taste. The last day in Busan I went out in the morning looking for breakfast. I stumbled upon a market and found a lady making egg sandwiches. She beat a couple eggs and fried them with cabbage. While that cooked, she smeared butter on two slices of bread (on both sides) and fried one side up. Then she put it all together and squirted ketchup all over it. It was kind of ghetto, but it really hit the spot. Our first meal in Daegu happened to coincide with a night of drinking. We had daeji bulgogi, which is grilled pork marinated in spices that can be wrapped in a lettuce or other leafy vegetables. It was very tasty and went well with the beer. We also had another potato pancake, this time with cheese melted on top of it. To wash it down, we tried some strawberry makgeolli. It was like an alcoholic milk shake – dangerous stuff! That night wasn’t just a great food night, we were on a mission. We wanted to test Korea’s hangover cure soup, which leads us to our next meal. After our booze-filled night of debauchery, we got up and carefully brought our hangovers to a haejang-guk restaurant, where we tried a shredded pork hangover soup. It was incredibly tasty. Sara called it the best soup she ever had. Did it cure our hangovers? Well, you’ll have to watch the video, which features both of these meals, to find out. For our last meal in Korea, we kind of ef’d up and went to a place that served Japanese food. Admittedly, I wasn’t thinking about an epic ending to this blog post at the time – I just saw the food and went for it. It turned out to be a great meal, and it also showcases the growing influence that Japan has on Korea. One person I talked to said that Koreans used to dislike Japanese brands, but now the younger generation is embracing the country – both its products and its dishes. It’s a bowl of rice topped with meat and vegetables. I had fried chicken cutlet and tiger shrimp. They cook it in the bowl and crack an egg on the whole thing. A very tasty meal by Daegu’s shopping street, Dongseong-ro. Well, I hope you’re hungry. I certainly am. At the end of our trip, Sara and I both agreed that South Korea was one of the best food countries we had ever been to. For good reason, their cuisine is becoming popular worldwide, and it’s actually pretty authentic in most restaurants across the globe, but to really experience it you should go to Korea. Like, now. Pack your bags, and don’t forget to bring your appetite.